Shirts are shirts and jeans are jeans, but shoes are friends. They have quirks and temperaments and personalities and I love them ... as disturbingly evidenced above. I'm much more tempted to ADD shoes to my life than to subtract them. In fact, even though I personally decided to cull my collection, the truth is, I didn't have a lot of enthusiasm about it. So why bother? As a person, I do much better at beginning things than at cultivating them. This is true for possessions (buying them vs looking after them), relationships, and goals. This year, I'm trying to be more mindful of that, with my do less, be more resolution. Less stress. More joy. For me, I think a little scaling back is in order, but maybe that's not what adding joy looks like in your circumstance. For example, speaking of adding joy AND shoes to one's life, check out this amazing story from my friend Leanne. 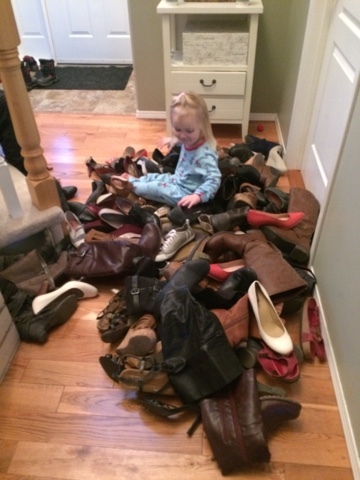 She's living in Panama and has recently discovered a newfound love of shoes. 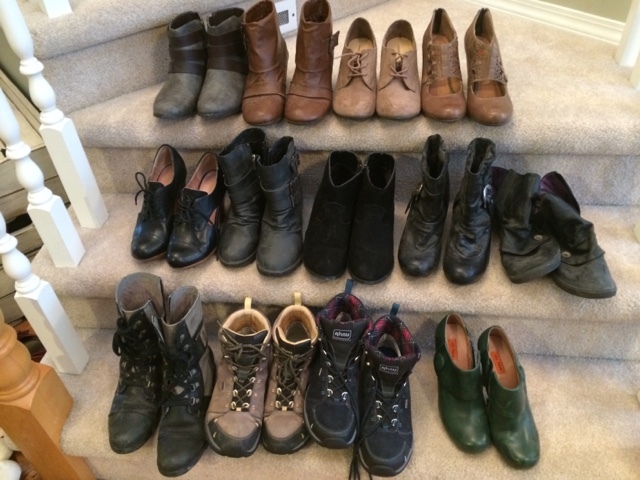 It's funny; I, too, have hopped on the Less is More bandwagon for 2016, with the express exception of shoes! I've been slowly building up my shoe stash after finally finding a store here in Panama that a) actually sells size 10shoes, and b) sells quality items within my budget. 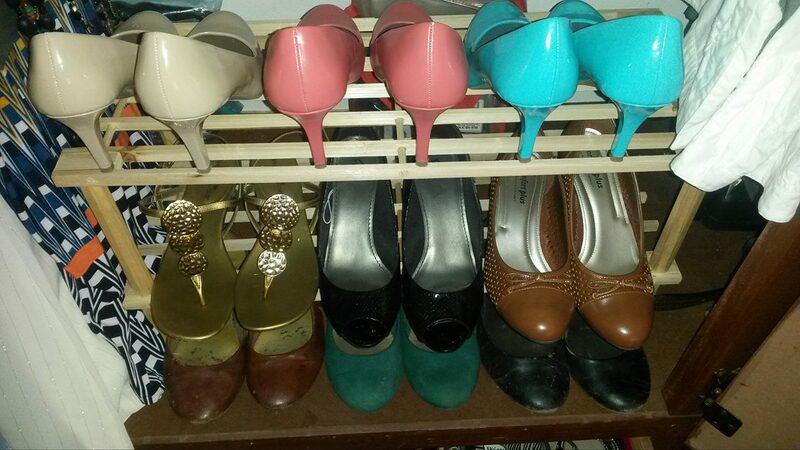 For years I was the girl with just two pair of shoes (black flats and brown flats) and a few pair of sandals. Now I am finally embracing variety, and it is so much fun! I actually own a pair of pink heels AND a pair of blue heels! Joy abounds any time I leave the house! I've been DYING to share this excitement with someone! Now to tackle the rest of my wardrobe...(cue ominous music). If I can up the joy level of the rest of my clothes to match that of my shoes, this will be one sunny year, indeed! I love everything about this story. Now I just want to see a fabulous photo of Leanne modeling these babies! I think fashion is such a fun outlet of personal expression and it's so fun to share. 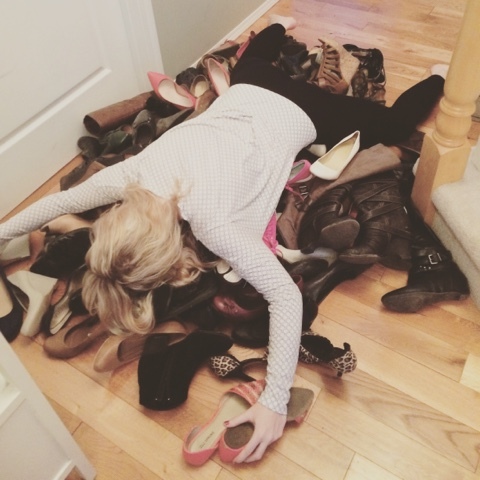 Thanks for sharing your shoe joy, Leanne. It made my day! All right. Back on topic. It's time to talk about the great shoe clear-out of 2016. I had already cleared out a LOT of cheap and dated ballet flat type shoes and flip-flops this last year. My feet are getting old (JUST my feet) and as a teacher I do a lot of standing on concrete AND I was pregnant, so a whole lot of shoes got tossed in fits of rage cleaning. Thus, this round wasn't quite as all encompassing as I had originally envisioned. 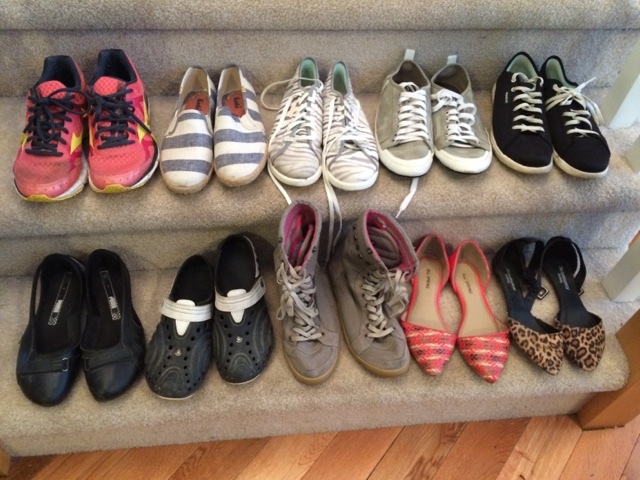 According to The Life-Changing Magic of Tidying Up (a ZANY little book I reviewed here), I am going about downsizing completely incorrectly by starting with my feet. However, I also don't allow my socks to "breathe" OR stack my carrots in the fridge vertically, so agree to disagree, tidying guru. So, basically... it wasn't THAT bad. 1. I dumped all my shoes on the floor (except my rubber boots which are in the shed and a pair of runners that I use for working out which are at my sister's). Right now you're either thinking, "Well, that isn't EVEN BAD!" 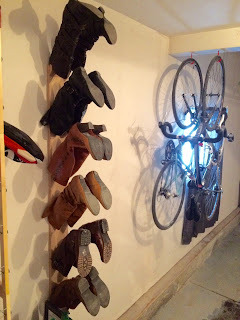 Or you're thinking, "WHO NEEDS THAT MANY SHOES? She's insane." You can be friends with my husband. 2. Emily and I frolicked among them for a while. I have two pairs of the same hikers. I LOVE my old hikers. They fit amazingly well and they have sentimental value to me. I've hiked some epic mountains with them, had some amazing conversations with hiking partners in them, and even though they are purple and yellow, they are stained with the red dirt of the Kenyan highlands and I have a really hard time letting go of them. But it's time. Wow, I apparently really needed cream pumps in stiletto, wedge, and thick heels even though they look EXACTLY THE SAME. The winners cost a little more, but are still classic. Favourite pump brand for sticker value? Nine West. I thought I was going to be a gardener once (I'm an excellent BEGINNER OF THINGS, remember?). I'm not, but somehow I still ended up with a pair of Crocs. I'm upset too. High tops. I don't know. I wanted to be Punky Brewster? Who didn't? I stand by my Reebok Skyscapes. Both pairs. I don't care if they're cool or not. I love wearing shoes with no socks (gross, I know), and these are made of foam. They are so comfy and light and I can walk for miles in them and then THROW THEM IN THE WASHING MACHINE. Sold. Plus, I see they are now in a loafer for 40% off... Gasp. Be still, my heart. Okay, maybe one more pair of crocs... (I SAID, DON'T JUDGE ME) but these ones are keepers. Grouping my shoes and visually comparing them helped me see what was boring, worn-out, outdated, or where I was making repetitive style or colour choices. 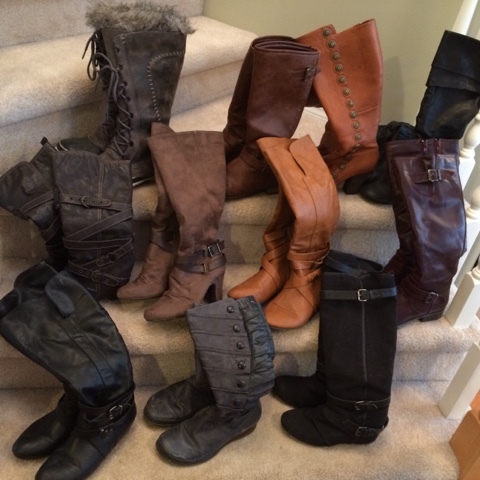 I was also reminded of a few pairs of boots that I haven't worn yet this winter. I organized the rest of them and put them away. 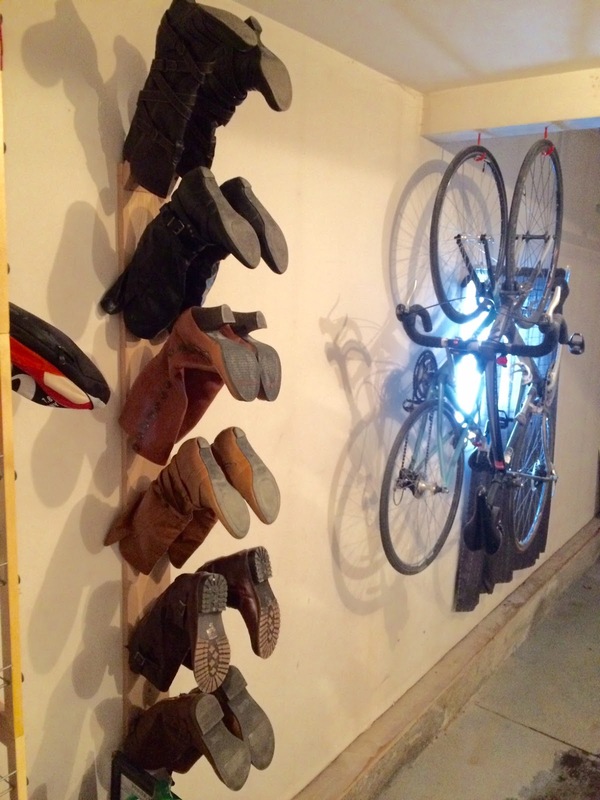 If your husband truly is sick of your boots loves you, he too will build you a boot rack in the garage. This is what "Pump it Up" means, right? Next step? Wear them all. While I'm not planning on purchasing any new shoes right now, IF I WERE, this would have given me a great starting point for deliberately growing a collection. 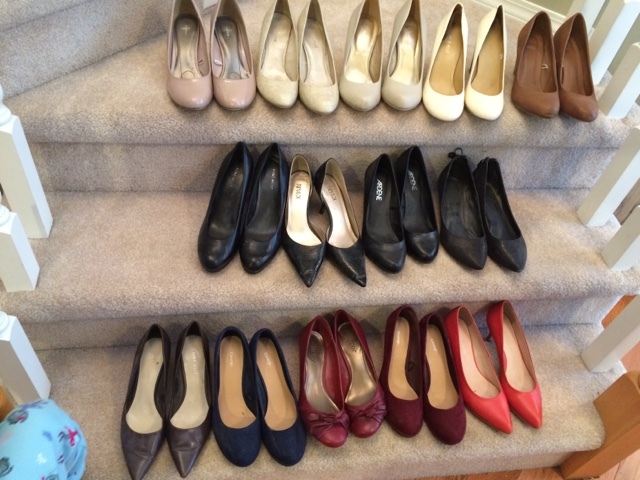 When Oprah buys my blog, we'll all get shoes... Don't quit your day job. This week on reMOVE it Monday? The rest of my clothing. Let's just get it over with already. I've been doing a fairly decent job of keeping the girls' clothing up to date and packed away by size, but it's time to take a long hard look at the rest of my clothes and do a large-scale purge. Ladies-in-between-kids, how many separate wardrobes do you have? Seriously. I have the flat chested wardrobe, the "oh there they are" collection, the slightly pregnant or postpartum stuff, the "maybe one day I'll have another" maternity clothes and then the "one day I'll fit this again" wardrobe. How do you choose what to hold onto and what to get rid of? I'd love to hear your suggestions this week. Update next Monday! Thanks! Now to wear them all!! Oooh! What an honour to be showcased in your blog, Abbie! Thank you for sharing in my shoe enthusiasm. P.S. I am now seriously lamenting that you and I have different shoe sizes; I can't keep my eyes off your wine-coloured pumps on the top row of your Shoo Shoes! Shoethusiam? I think this should be a word. Haha. Yes, they are now in a better place. 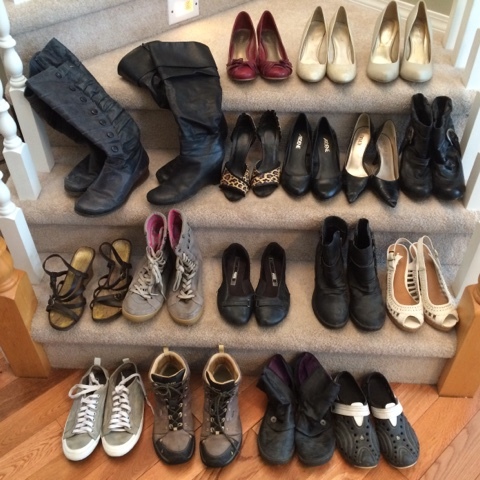 Loved seeing pictures of all your shoes....I also love Nine West for the price and the uniqueness. I also spotted some Miz Mooz in there. Ah, I heart shoes. If I could get my hands on your collection... look out, world!